What Do the Most Successful Petitions Have in Common? Petitions, both online and offline, have long been a way of spreading ideas. 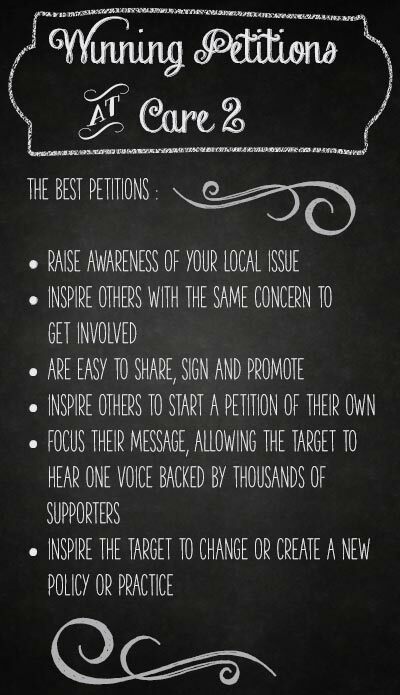 In a digital world, it’s crucial to understand the best practices for building a dynamite petition. Ideally, a petition influences its target to grant the request, but a petition can also be successful by initiating a swell of public opinion toward change. Moving the needle, even a little, can have long-lasting effects! Read on for examples of our most successful petitions! Still needing inspiration for your petitions? Here are some terrific examples of how people have used a Care2 petition as a part of their overall campaign. The petition for Karma the Husky stands out as an amazing win! The petition author, Danna, collected an astounding 362,500 signatures to pressure the Orange County Animal Control not to euthanize a dog whom the government deemed to be part wolf. The petition ultimately saved the animal’s life, and she was sent to a rescue in North Carolina! This petition was well-crafted with a clear target and a well-defined goal, and provided many updates for supporters along the way. Here’s another winning petition regarding gender-neutral bathrooms, which helped to inspire a separate petition for transgender bathroom use. In both cases, the petition target granted the request of the petitioners! We love when petitions inspire action for similar issues across the nation. Your local petition may only need a couple hundred signatures to attract attention and begin a national movement for initiating change! There’s a constantly growing number of success stories, from freeing Raju the elephant from captivity (and thus raising attention to the plight of abused elephants across India) to changing a policy that allowed a 10-year-old girl to receive a lung transplant. Make sure to use all the resources available on Care2 to make your petition the strongest it can be! We want to add your cause to our list of expanding success stories! We can help you to craft the strongest petition possible, provide tools to share your petition with those around you and even promote your petition to our network of online activists. Email us at petitionnullquestionsnull@care2nullteam.com to get the ball rolling! It all starts with you. What would you like to change? What difference can you make? Get started today and see how easy it can be to start your very own petition!